It’s bad enough when acne breaks out on your face. But when acne breaks out on your scalp and neck and chest and back and buttocks, it’s just plain unfair. Even worse, the methods that treat facial acne usually are not strong enough to take care of acne elsewhere on your body. This article will tell you why acne breaks out on the body and what you can—and can’t—do to get rid of it for good. Unless you have acne conglobata, the first line of defense against body acne is benzoyl peroxide foam. Medical surveys have discovered that about 98% of people who have acne somewhere on the body other than the face also have acne on the face. The basics of treating body acne are the same as for treating facial acne, except that stronger products are needed. The first line of treatment for most cases of body acne (except acne conglobata) is benzoyl peroxide, in a stronger concentration than can be used on the face. Benzoyl peroxide foam works on body acne, but benzoyl peroxide washes do not. If you break out when you work out, be sure to take a shower within four hours of perspiring heavily, and use a shower mitt to exfoliate dead skin that can clog pores. 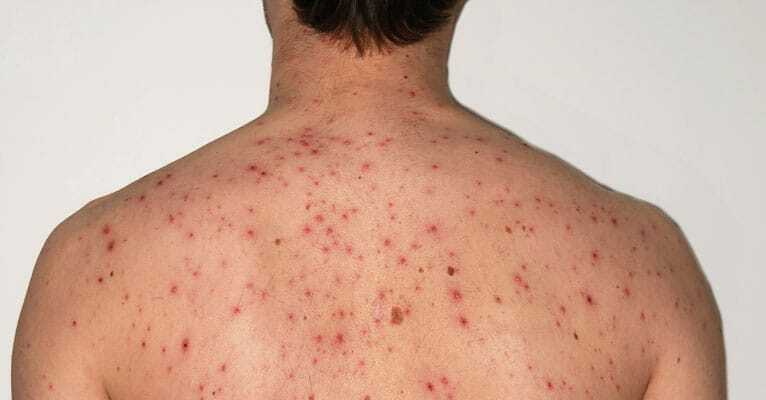 What Are the Types of Body Acne? Most people who have acne on the chest or back also have acne on the face. A survey of Canadians who were referred to dermatologists for acne treatment found that 92% had facial acne, and 45% and 61% and acne on the chest and back, respectively. An American study found that 47% of acne patients had blemishes on the face alone, while 52% had acne breakouts on both the face and back. When people who have acne see their doctors, however, they usually forget to mention that they have back acne or chest acne. Acne that is not on the face does not get treated because people don’t seek help for it. Acne on the torso, the neck and the scalp, and even the buttocks can be mild to severe. The type of acne that breaks out on the body, however, is usually the same as the kind of acne that breaks out on the face. Acne vulgaris or common acne forms in the same way on the body as it does on the face. The difference between acne vulgaris on the body and acne vulgaris on the face is that the skin on the body is tougher and less flexible around pores. “Friction” acne, or acne mechanica, most often breaks out on the skin where straps or pads in uniforms or jerseys rub against the skin and trap sweat. The friction between the skin and clothing breaks down the lining of pores. The trapped sweat over-hydrates the skin so that it wrinkles and the topmost layer of skin dies. Flakes of skin get lodged in the openings of pores and oil and acne bacteria accumulate inside, making blackheads and pimples break out. Most people who get friction acne also have facial acne, but in about 2% of cases the problem is limited just to acne on the body where skin is constricted by clothing. Acne conglobata is a “burrowing” form of acne that can appear on the face, neck, shoulders, chest, or buttocks. Pimples pop out in groups of two or three, and then coalesce into a large, painful, dark red lesion. Acne conglobata is a different story, though. It’s a kind of acne that isn’t really due to clogged pores. It’s caused by fluctuating hormones and usually has to be treated medically. Acne vulgaris and friction acne on the torso, however, can be treated with the same kinds of treatments used to treat facial acne, only at a stronger concentration. Note: It’s not always acne. Bustline – If little red, itchy, irritated bumps pop up along the bra-line, it might be a yeast infection or a bacterial infection and not acne. You can help prevent and treat this by using an anti-fungal powder or antiperspirant to the area. If the rash-looking infection has already appeared, consider applying a light layer of miconazole lotion. Buttne – Little bumps that raise up on your bottom are common and often referred to as buttne. It may look like acne, but they’re normally infected hair follicles. Try using salicylic acid or benzoyl peroxide soon after workouts. Bikini line – Again, little red bumps along the bikini line may look like acne, but in this case it’s often ingrown hairs or razor burn. Prevent it by using a gentle shaving gel with a sharp razor at the end of your shower. You can treat it with something gentle like hydrocortisone or aloe vera. Just skip spandex and other synthetic materials and stick to lightweight cotton materials. Synthetic materials like spandex just ends up trapping moisture and oil in that can lead to clogged pores and breakouts. On the other hand, loose cotton clothing and materials made to wick away moisture allows your skin to breathe and doesn’t trap sweat in. Both gym equipment and the clothes you workout in could be a problem. You obviously can’t prevent sweating during your gym workout, but you can be aware and proactive about minimizing the exposure to acne causing bacteria. Bring along some antibacterial wipes to wipe down equipment before using it. Dab away sweat often with a towel during a workout and get into the shower as soon as possible after you’re finished. Sheets that aren’t changed out and washed regularly collect dead skin cells, sweat, dirt and oil that can be transferred onto your skin while you’re sleeping. Again, choose light weight, moisture-wicking sheets like cotton and wash them a couple times per week. It’s been said for ages – chocolate and fatty junk foods cause you to breakout. But this isn’t really true. Yes, there is some research that’s recently shown that certain foods might influence or aggravate acne or make a current breakout worse. But enjoying a candy bar today doesn’t mean you’re going to breakout tonight or tomorrow. However, a balanced, low-glycemic diet with plenty of nutrients and antioxidants from lean protein, healthy fats and fruits and veggies is not only healthy for your body, but for your skin too. Stress is known to be a big factor in adult acne, so it only makes sense that it could be a factor in your body acne too. When you’re under stress, cortisol levels are increased by the adrenal glands, which leads to an increase in oil production by the sebaceous glands. More oil means better chances of clogged pores. But your immune system is also affected, making it harder for your body to deal with blemishes. Your immune system’s effectiveness can drop by 40%. In fact, the link between stress and the immune system is so well known that today there’s a medical field dedicated to it – psychoneuroimmunology. If you’re using any medications or undergoing any type of medical treatment, talk to your doctor to see if it could potentially be known for causing or worsening acne. Benzoyl peroxide is the world’s most commonly recommended product for facial acne. It is available in over-the-counter and prescription products. Usually over-the-counter products contain 2.5% to 10% benzoyl peroxide, while prescription products are 5% benzoyl peroxide or more. There is no doubt that benzoyl peroxide can kill acne bacteria, but that’s really only part of the process of healing acne. Killing acne bacteria stops new inflammation and gives the skin a chance to heal itself, but it does not “get the red out” and it does relatively little to break up hard, waxy sebum deposits in blackheads and whiteheads on the face—because the skin of the face is too delicate for the higher-strength formulas of benzoyl peroxide that can get rid of whiteheads and blackheads as well as pimples. The skin on the neck, chest, and back, however, can stand up to a much stronger benzoyl peroxide product. It’s easy to use benzoyl peroxide foam. Just point and spray. Even if you are a man who has a hairy back, the foam will find the pores where it is needed for disinfection and exfoliation. Leave the product on acne-prone skin for five minutes and then rinse thoroughly with warm water, taking care to use a clean towel when drying off. It is important not to put dirt and bacteria on your skin after you have rinsed them away. There are also 8% and 10% benzoyl peroxide washes that usually don’t work, because they are rinsed away too quickly for the product to do its work. Only benzoyl peroxide foams are effective on body acne. What About Other Products and Treatments for Body Acne? There are many other great products for acne on your face, including tea tree oil, alpha- and beta-hydroxy acids, and medications that have to be prescribed by your doctor. Over the counter products will normally contain ingredients like benzoyl peroxide to unclog pores, alpha-hydroxy acid or salicylic acid to dry up existing blemishes or tea tree oil to kill acne causing bacteria. Most of these products will rarely work for body acne. The toughness of the skin and the difficulty of reaching the affected skin makes them impractical for treating blemishes on the back, chest, and buttocks. Benzoyl peroxide foams are your first choice for treating body acne. If you are in that small minority of people who have only body acne without facial acne, however, there is another approach to getting blemishes under control. If you have friction acne, then it is critically important that you shower after you work out in tight uniforms or gym clothes. Scientific studies have found that acne bacteria and oil begin to accumulate in pores about four hours after the skin is placed under restrictive clothing. That means that if you work out for an hour, or you have a gym class for an hour, you have a maximum of about three hours to get a shower to keep pimples from breaking out on your back and chest. But while cleansing is a vital part of preventing or clearing body acne, remember that there is such a thing as going overboard. Excessively scrubbing your skin, showering too often, showering in super hot water or using cleansers that are too strong can all have a negative impact and end up making the situation worse. Exfoliation is good, but should only be done once or twice per week. Cleanse two times a day with a gentle cleanser, shower after a workout and reduce friction on the skin. In severe cases, sometimes home treatment and over the counter products just aren’t going to cut it. In this case, there are many medications that may be used to clear your acne. Birth control and other medications may be an option. Antibiotics – Antibiotics used to treat acne often contain erythromycin or tetracycline, which help keep bacteria from growing. It’s a known fact though that the type of bacteria that causes acne can become resistant to them. Oral medications – Thankfully, antibiotics are far from the only answer. 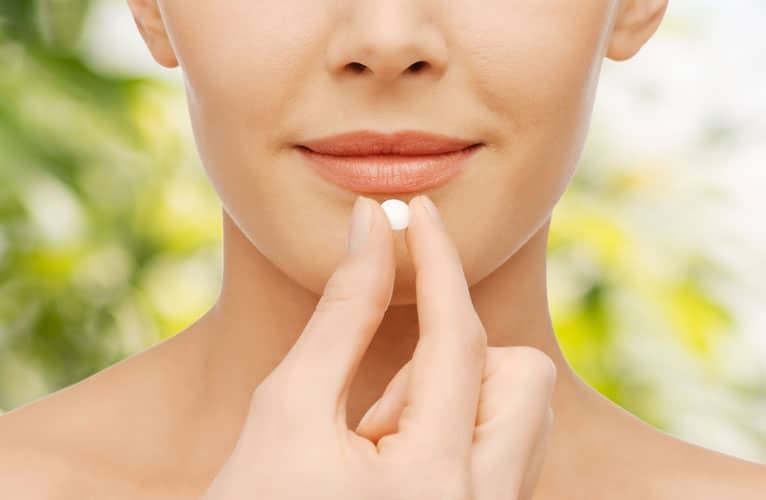 Several types of birth control pills are commonly prescribed to women to keep hormone levels in check and acne under control. In severe cases, isotretinoin may be prescribed, which shrinks sebaceous glands and helps prevent excess oil production. Prescription strength topical applications – There are two types of topical treatments that are commonly used: retinoids to unclog pores and antimicrobials to decrease the number of bacteria that causes acne. They can come in the form of a cream, lotion, gel, liquid or other form. These are fine for treating face acne, but it can be a challenge to reach some types of body acne with them. Ask your doctor about spray forms to make it easier to reach those trouble spots. When you’re dealing the acne on your face, you don’t want to jump right in using different products at the same time that might irritate the skin. When that happens, it’s hard to tell which product is the culprit. But with body acne, the skin is thicker and stronger so it can tolerate stronger products with minimal or no irritation. In the off chance that any irritation does occur, it’s likely easy to cover just by putting clothes on. Not so easy when it happens on the face. So don’t be afraid to experiment to find what works for your skin. With that said though, don’t go completely crazy with it. Rubbing and scrubbing every possible thing you think might work will probably make the situation worse. And remember that products with active ingredients like AHAs and salicylic acid may make your skin more sensitive to the sun. So don’t forget the sunscreen (which you should be using anyways). Acne scars aren’t limited to just the face. Body acne can just as easily leave scars. If you’re dealing with scars leftover from blemishes on the body, there are a number or things that can help. It’s a good idea to talk to your doctor about the best method for you. Normally, methods of removing severe body scars will involve removing top layers of the scar tissue and skin layers. Dermabrasion is often used in severe cases. For scars that are less severe, microdermabrasion with a hand-held device may get the job done. Chemical peels or laser resurfacing are also possibilities. Some people aren’t comfortable with the thought of scraping, burning or removing skin layers. If that’s the case, then collagen injections might be something to consider if the scars are the type that have left an indent in the skin. The collagen will plump up the skin, creating the illusion of a smoother surface and minimizing the scar’s appearance. Body acne tends to be easier to control than facial acne. But for the best facial skin care, consider a complete treatment such as Exposed Skin Care.